You know the feeling when you are about to meet an old friend after a long period of time, with excitement and expectations on high alert? That’s a bit how I felt when I recently boarded Holland America Line’s Eurodam on its first Caribbean sailing of the season. It had arrived early that morning after crossing the pond from Europe. I sailed on Eurodam’s maiden crossing in 2008 from Copenhagen to New York and Ft. Lauderdale. I enjoyed that initial sailing on Eurodam and today discovered you can go “home” again. My weeklong Eastern Caribbean cruise was great and the ship just as pleasant as I remembered, with some new amenities and some very contemporary vibes. Eurodam is a mid-size vessel, carrying 2,100 guests with several dining choices in addition to the traditional dining room and Lido Deck options, super entertainment choices and excellent shopping venues. It belongs in HAL’s “Signature” Class of vessel, (its sister is Nieuw Amsterdam.). 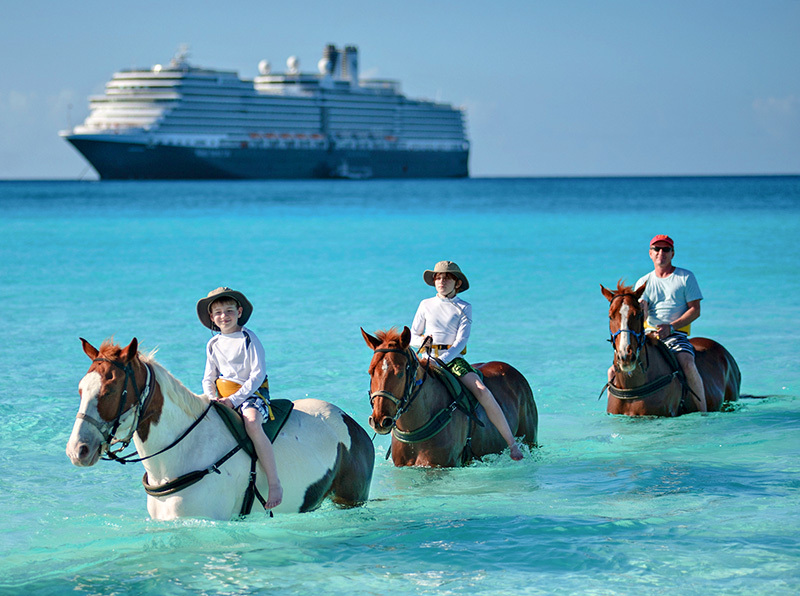 Holland America has always been a solid choice for cruisers. The line, founded in the 1870s in Holland, became part of the Carnival family in the late 1980s and offers worldwide itineraries and a standard of service that brings repeat passengers by the hundreds back aboard its ships. Until recently the line was a fairly staid option with strong dress codes, string musicians entertaining in bars and lounges and those two dining options. Guests knew what to expect and, time after time, found exactly that. Today’s Eurodam is not your father’s Holland America ship. The staff continues to be made up primarily of men and women from the Philippines and Indonesia. They provide a traditionally high level of service that HAL has honed into a fine art. And the 21st century is alive and well on this venerable line and continues to pleasantly surprise returning guests. Consider the new B.B. King’s Blues Club showcasing a group of amazing performers who do three shows a day, six days a week, offering blues, soul and Motown, while every toe in the club taps. The Blues Club is part of the Billboard Onboard project. Billboard is a partner with HAL in the new music experience called Music Walk. Lincoln Center Stage will offer another musical experience, chamber music, and Billboard Onboard will feature hits straight off the charts after the ship spends a few days in dry-dock in December. 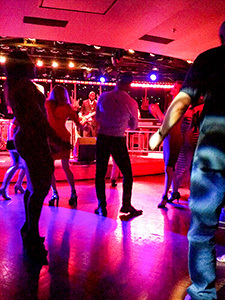 Another entertainment experience is Dancing with the Stars at Sea, a contest made up of performers and shipboard guests, with a fantastic final dance-off à la the television version. Other activities include varied trivia games, food preparation ops in the Culinary Center, wine tastings, and a large library on Deck 11 called Explorations, which also houses a coffee shop, Internet Café, and the popular Crow’s Nest Lounge. A movie is shown in the ship’s cinema daily, and the casino features table games as well as slot machines. Looking for art? A Park West Gallery offers a variety of seminars and beautiful artwork. Shopping venues offer an array of merchandise from costume jewelry, fragrance and logoed items to fine jewelry. 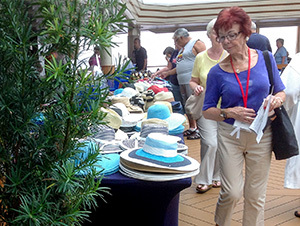 One day during the cruise, merchandise is offered on the Lido deck. Culinary Center and Blues Club alternate in the Queen’s Lounge. The Digital Workshop offers classes in Windows 10 and getting the best pictures with your digital camera. And there’s a great spa and gym for your fitness pleasure. Eurodam alternates between the Eastern and Western Caribbean. The itinerary I sailed on is the Eastern Itinerary: Grand Turk, in the Turks and Caicos, San Juan, Puerto Rico, and St. Martin, that great two-in-one island which is French on one side, Dutch on the other. The final port of call is at HAL’s private island, Half Moon Cay, where cruisers can choose from such diverse activities as horseback riding in the surf, kayaking or biking, massages on the beach, riding a personal watercraft or on a glass-bottom boat. The choices are many. And that’s really the essence of any cruise experience. A cruise vacation offers that trite-but-true option to do what you want, when you want, and, when it comes to dining, where you want. Eurodam’s dining options are a case in point: My personal favorite on Eurodam is Tamarind, a pan-Asian restaurant, beautifully decorated, which offers an exquisitely flavored menu. It’s located on Deck 11, across from the charming Silk Den Bar, and charges a surcharge. Another restaurant, a staple with HAL, is the Pinnacle restaurant, which specializes in steak and seafood. 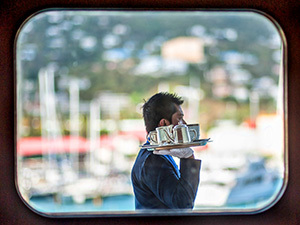 The restaurant also provides Le Cirque, “pop-up” eatery featuring the culinary style of New York’s famed Le Cirque, and Canaletto, an Italian-accented restaurant on the Lido Deck. All carry a surcharge, different in each venue. 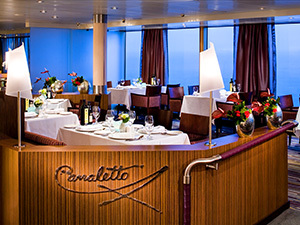 There’s no charge for Lido Deck dining or in the main restaurant, Rembrandt. In-room dining is also available. Other activities include varied trivia games, food preparation ops in the Culinary Center, wine tastings, and a large library on Deck 11 called Explorations, which also houses a coffee shop, Internet Café, and the popular Crow’s Nest Lounge. A movie is shown in the ship’s cinema daily, and the casino features table games as well as slot machines.,Thanks For Sharing .